1) My husband and I will be married 11 years this July. 2) Until I was about 13 I had never lived anywhere longer than 1.5 years (and as short as 3 months)! We traveled for my dad's job. 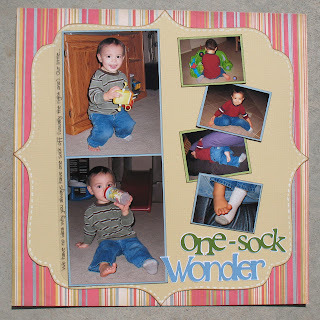 4) I have been scrapbooking for 10 years and just started making cards about 6 months ago. I LOVE it! 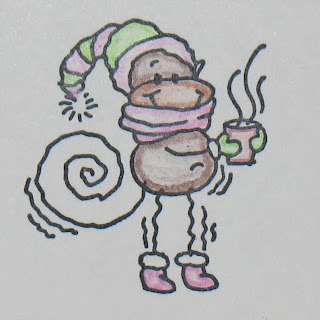 5) I am addicted to pomagranates - I eat one almost everyday when they are in season! 6) My husband and I love movies - we have about 150 movies in our collection right now. 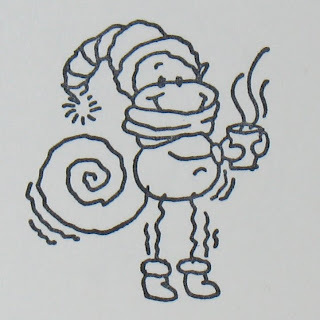 8) I am also an avid reader. In between crafting and my family I still somehow manage to read about 2 books a week. Cindy at Crazy for Crafting - She is a talented designer and has some great .cut files you can download for the Cricut Design Studio or Gypsy! Jamie at Cute Cards and Crafts by Jaime - The name says it all, they are cute! 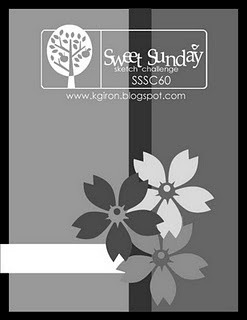 Shelley at Sweet Fancy Scrapbooking - Check her out for some great layout ideas! 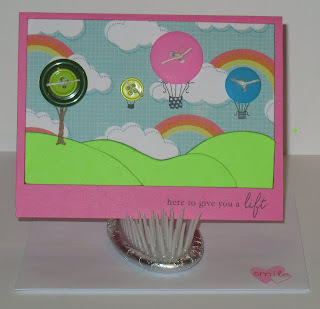 Crystal at Sweet Teetle - She is super sweet and has some great projects ideas! 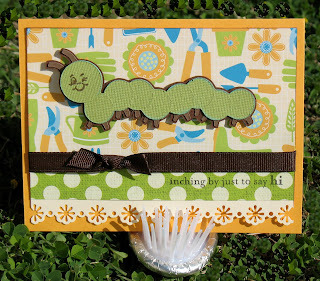 Sara at Live Love and Scrap - Her pages and cards are adorable and she is so nice! Dawn at Flip Flops and Poptarts - She has some absolutely beautiful layouts! 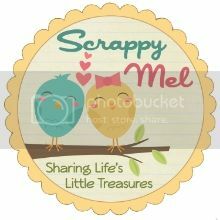 Jenn at Scrappin Phlen - Check her out for cute, cute, cute projects! Susan at Scrappy Susan - Her projects are so fun and creative! 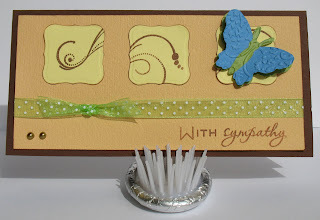 Nanne at Nanne's Creations- She has gorgeous, intricate layouts! 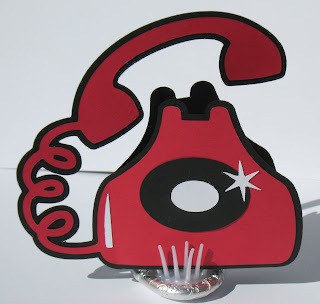 Sara at Cricut Addicts Anonymnous - She may be a new blogger but she is so creative! And last but not least, Nicole at Canadian Nickel Scrap'n and Emma at My Creative Time - Check them out for great projects and videos! Thanks ladies for the inspiration! Design Studio and new layout! I still am not sure if I LOVE it, but I was able to get my words welded and shadowed, which was the main reason I bought it. 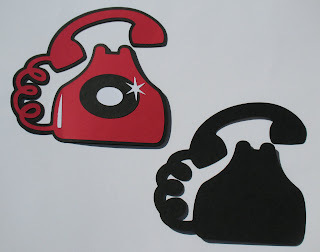 I tried the trial verson of Sure-Cuts-a-Lot and it is easier to shadow (ok, WAY easier) but it scares me that it could mess up my Cricut machine (and it's 3x the price). So after a good amount of fiddling I completed the title for this page with CDS and Plantin Schoolbook and Alphalicious. The stamps are from Paper Tray Ink - Every Day Button Bits. 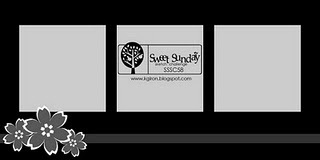 There's still time to play along, the Sweet Sunday Sketch challenge is open until Thursday at midnight and the Pink Elephant challege is open until Sunday at midnight! 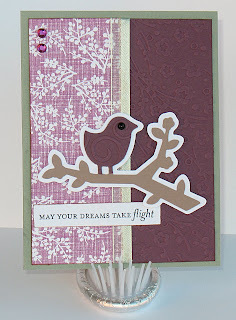 The bird was cut from the Songbird Cricut Cartridge at 2" and I used the Plum Blossom embossing folder from Cuttlebug. The sentiment is from Paper Trey Ink. 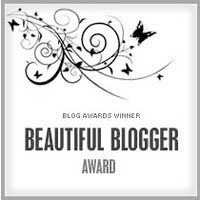 *Be prepared - lots of photos! 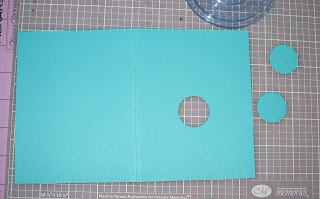 Step 2 - Cut a 1.25" circle in the front of the card where you want the belly to be - this is the side of the card that has 2 pieces of cardstock. 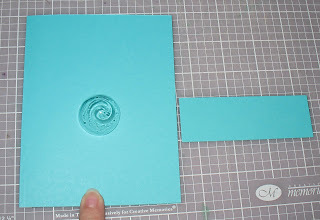 I use the Creative Memories Circle Cutter but you can also use your cricut and the multi-cut function. 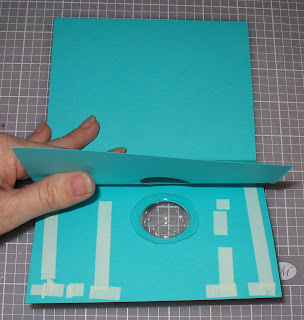 For the CM cutter you will need to cut the first layer, remove the circle and then cut the second layer. Don't move your cutting guide or the circles won't match up and use FIRM pressure to get a clean cut. Step 3 - I use the Truffle Candy Mold by Wilton, cut one of the molds out of the tray leaving a .25" lip all the way around for adhesive. I like to use tacky-tape for the cup - it is a powerful hold! 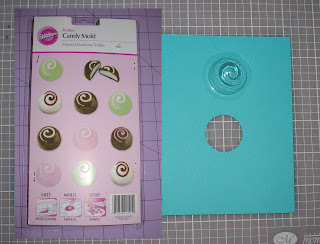 :) Place adhesive around the lip of the candy mold (the lip that is on the convex part of the mold) and around the sides of the card. 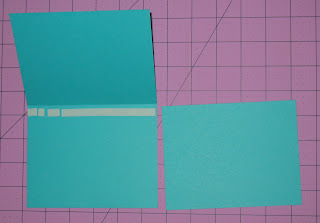 Don't put adhesive on the section of the card where the slider goes - see the photo above. 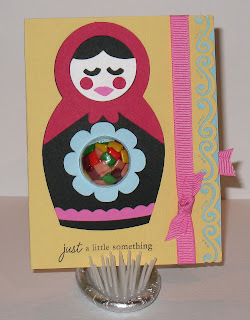 To add the candy or gum just pull the sider open. Hope you enjoyed it! Let me know if you have any questions. 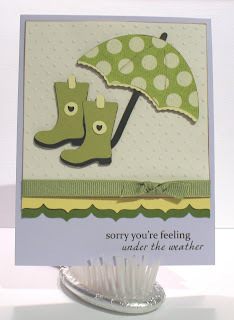 For those that are interested, I cut the umbrella at 3" and the boots at 1.5". Thanks for taking a peek. Hello all! I have been experimenting with a new techique for using colored pencils. 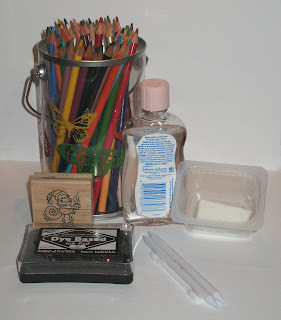 I was doing research about how to blend them and found lots of info on using Gamsol or Odorless Mineral Spirits (OMS). The one thing that bothered me was that it has toxic fumes - even if you can't smell it as stongly as other thinners like turpintine. So, I was on a hunt to find something non-toxic as possible. 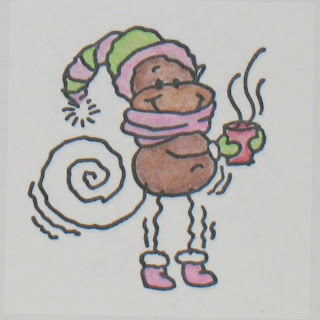 I found a few links that said they had used baby oil - hummm... smells good... used on baby's bum... can't be too toxic, right? Step #1 - Stamp your image. Step #2 - Color your image. I like to laydown a heavy layer just inside the line, then lightly color the center of the area. Some people only color just inside the line and blend toward the center but I thought it left the center without enough color. You can play around until you get it to look right for you. Step #3 - Baby oil. I recommend you put a small amount of the oil onto a cotton pad or make-up sponge like in the supply photo above. You just need a little bit and if you dip it directly into the oil your blender will be saturated. 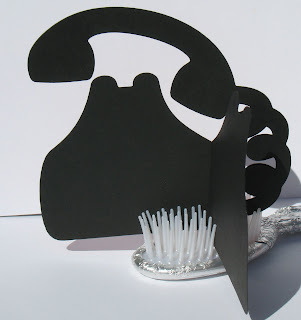 You can also blot the tip on a dry paper towel if you feel you picked up too much. Step #4 - Blend. Rub the tip of the blender across the area with the most pencil first to breakdown the wax. 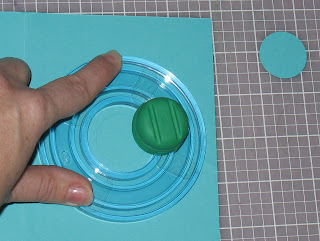 Then, using small circles, blend the color toward the center. Continue blending from the areas of high color toward the center until you like the effect. 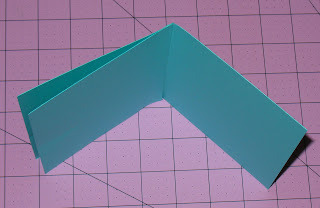 How to make a shape card w/o the Design Studio! Now you can write or stamp your greeting on the inside of the card - since this is black I would put a layer of white down before I stamp. :) Let me know if you have any questions. Here's the final basic product! 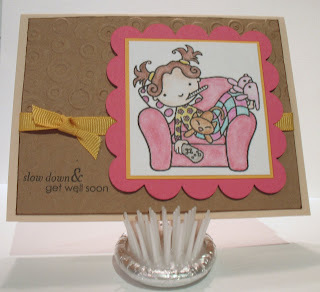 I think this stamp - Sick Lily - by Pink Cat Studios is just so cute! I had so much fun coloring her. 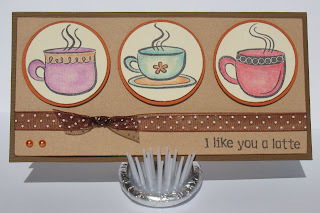 :) The sentiment is from Papertrey Ink Stamps.